What is the fundamental job of a gutter protector? Being a gutter protector is pretty tough work–24 hours a day, 365 days a year, year in and year out, the gutter protector has to defend your gutter, in all kinds of weather and wind storm conditions, against an assault of leaves, blossoms, twigs, birds, squirrels, balls, toys, and so on. However, there are some homes located under a canopy of trees–no daylight to be seen from late May to the end of November. It’s these homeowners who would normally have to clean their gutters 5-to-6 times in the fall and another 3-to-4 times in the spring to keep their gutters clean and free flowing that find “suit and tie” maintenance a welcome alternative to cleaning gutters. 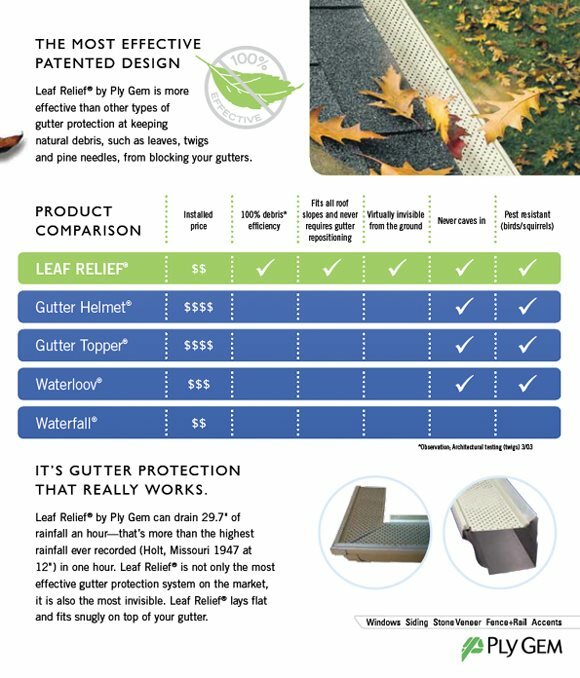 Leaf Relief brings real relief to homeowners who need a gutter solution that works, first time, every time. Our patented Aluma-Perf TechnologyTM keeps debris out of gutters, allowing water to flow freely. Debris is then lifted off of gutters by a normal breeze. Testing conducted by Architectural Testing, Inc.
No detrimental or damaging effects at 110 mph wind speed when fastened 16 inches on center. Testing conducted by Architectural Testing, Inc. Leaf Relief’s solid aluminum construction eliminates rusting, distortion or painting, making this product virtually maintenance-free. Practically invisible from the ground and made to fit most gutter systems, Leaf Relief has many attributes that set it apart from the competition. Our patented Aluma-Perf Technology™ means you won’t be climbing ladders to clean the debris out of your gutters. A normal breeze1 does the work for you. Does the product end frequent maintenance involved with keeping your gutters clean and free-flowing? Does the product require the partial removal of shingles? Does installation include screwing or nailing the product onto the roof? Will removal or disturbance of the roofing system void your roofing warranty? 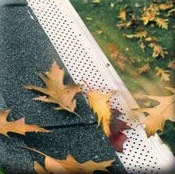 Is the product affordable compared to the other gutter protection products on the market today? Click here to view the Warranty Brochure in PDF.